At the end of the 19th century, the East Coast main line was seeing a steady growth in traffic resulting in increases in the size of passenger trains. The Great Northern Railway (GNR) answered this by introducing its first Atlantics (LNER C2), and in 1898 the North Eastern Railway (NER) proposed an enlarged 4-4-0. This quickly resulted in Wilson Worsdell's Class R (LNER D20) locomotives. These used a variety of design features that Wilson Worsdell had used on previous locomotives (eg. the D17s) but also incorporated a number of new developments to promote better running. The cylinders were 19in in diameter with a 26in stroke. Stephenson motion was retained, but they were operated by newly-developed outside admission piston valves fitted below the cylinders. A slide valve version was contemplated, but the piston valves proved so successful that they were never built. The boiler pressure was increased to 200psi. The diameter was increased to 4ft 9in diameter, and the firebox was lengthened to 7ft. At the time, this represented the largest NER boiler built. The new locomotives quickly proved very successful. The initial batch of ten was built in 1899, and was immediately followed by two more batches of ten each in 1900-1. Further locomotives were required five years later, and three batches of ten each were built in 1906-7. All sixty D20s were built at Gateshead. The final D20 to be built, No. 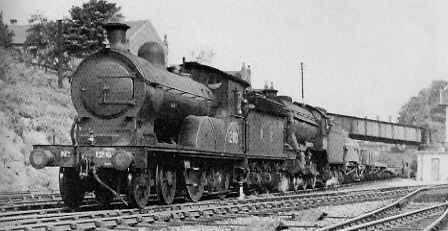 1235 was built with an extended smokebox containing a Sisterton superheater. This was trialled with a dynamometer car in 1908. The superheater was then expanded and trialled a second time in April 1909. The Sisterton superheater design was patented in 1906, and appears not to have been a success. It was removed shortly after the second trial. Raven successfully trialled superheating on his C7 (NER Class Z) Atlantics. With these successes, NER Management finally accepted superheating, and quickly moved to fit it to their other express locomotives. The D20s first received superheaters in 1912, and only two were still saturated at Grouping (1923). These were eventually superheated in 1925 and 1929. Most of the early superheated boilers were built with Schmidt superheaters, but seven were built with Robinson superheaters instead. Schmidt superheaters would become the standard until 1930, when a switch was made to LNER-standard Robinson superheaters. The opportunity was taken to fit mechanical lubricators for the cylinders, at the same time that superheaters were fitted. The high section of the frames originally extended beyond the front of the smokebox by a small amount. The fitting of superheaters required that the smokebox be extended by about 1ft in length. An extra section of frame was welded into the front curve of the frame section to correspond with the extended smokebox. The earliest D20s were fitted with new frames at about this time, although there was no connection between the fitting of new frames and superheating. All of the original boilers and spares were fitted with Ramsbottom safety valves in a polished brass trumpet cover. All D20 boilers built after 1916 were fitted with two Ross pop safety valves with a shallow circular cover around their base. Most of these covers were eventually removed, although a few D20s still had them at withdrawal. The last Ramsbottom-fitted boiler was replaced in December 1936. All of the D20s had dual-fitted brakes, with Westinghouse cylinders for both the engine and train, and a vacuum ejector for alternative train braking. The only exception was No. 2020 which had the Westinghouse pump removed after its 1936 rebuild (see below). By the 1930s, the D20s were beginning to get quite old. Instead of withdrawing them from service, it was decided to modernise these very capable machines. The boiler design was modified in 1934-5 to use a single plate barrel instead of the original three ring design. Sixteen extra tubes were added to the boiler, adding a total of 87 sq.ft. heating surface. External dimensions were virtually identical, and a small change in the position of the safety valves is impossible to see in photographs. The boiler modifications were followed by a series of piston valve modifications. No. 2020 was the first D20 to be modified, in 1936. The modifications moved the piston valves above the cylinders, and increased their size to 10in diameter. The valve travel was also increased to 6in. No. 2020 was also converted to left-hand drive. The modification programme stalled until Thompson became the LNER's Chief Mechanical Engineer in 1941. Thompson amended the modifications to include larger axleboxes, gravity feed lubricators, and modified wedge horns for the new axle boxes. Wartime shortages reduced many of these to an "as needed" status. In actuality, only three further D20s would be modified: No. 592 in October 1942, No. 2102 in December 1942, and No. 62375 (LNER No. 712) in October 1948. This final modification may have been to use up spare cylinders that had been cast in 1942. The rebuilt engines were classified as class D20/2, and the un-rebuilt D20s became D20/1. The one exception was No. 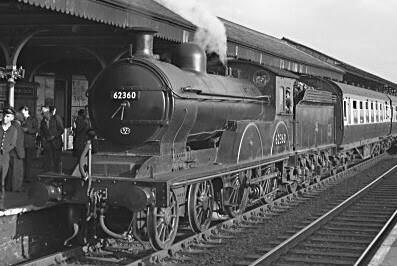 62375 which was officially classified as "un-rebuilt D20/1" due to special instructions from British Railways Railway Executive. It is uncertain exactly why this was, although it appears possible that the Railway Executive had not sanctioned the final rebuild. The NER Class R (LNER D20) quickly proved to be a great success on express passenger services. They also proved very reliable. The first locomotive (No. 2011) was quickly put to work on a double schedule with two crews working from Newcastle to Edinburgh and Leeds every day for six days a week. This was maintained with hardly any breaks for two years. No. 2011 managed to clock up the amazing mileage of 284,182 miles by the time it received its first general overhaul in March 1903. The remainder of the first batch was operated by single crews, but still managed to clock up an average of 163,000 miles before their first general overhauls. During these early duties, the D20s could be found operating the main express passenger services between York, Leeds, Newcastle, and on to Edinburgh. After 1903, they operated these services alongside C6 (NER Class V) Atlantics. When further locomotives were required in 1906, it was the D20 that was chosen and not the more recent C6. By Grouping (1923), the Raven C7 (NER Class Z) Atlantics were working most of the main express services on the NER network, but 54 D20s were still allocated to main line sheds and operating main line services. The remainder were allocated to Botanic Gardens Hull (5), and Blaydon (1). During this period, they were occasionally seen in the southern sections of the LNER network. There were noted hauling many of the excursions to the British Empire Exhibition (1924-5) via Kings Cross. These excursions were usually timed to allow the passengers extended lengths of time in London. This resulted in Kings Cross often using the spare D20 on local midday traffic. During both 1924 and 1925, D20s were sighted hauling Great Northern Railway (GNR) coaches to Baldock. Atlantics were usually used on the London excursions after the British Empire Exhibition closed, although double-headed D20s were sometimes substituted. The class saw two significant reductions in status during the 1920s. The first was the widespread introduction of Gresley A1 Pacifics which displaced the C7 Atlantics from their express duties to the lesser main line services then occupied by the D20s. This was followed by the introduction of the Gresley D49 Hunt/Shires. These changes led to widespread movement of the D20s away from the main line sheds to secondary duties. By 1935, the D20s were allocated at York (10), Botanic Gardens (1), Starbeck (8), Tweedmouth (6), Darlington (5), West Hartlepool (4), Scarborough (4), Heaton (3), Gateshead (3), Neville Hill (3), Selby (2), Blaydon (1), and Stockton (1). As can be seen, York retained a high allocation, although this was reduced from the 1923 allocation of 15. Although the D20s were hauling secondary services during much of the 1930s, they were often given some tight timetables. Examples include Leeds to York in 27 minutes, York to Scarborough in 45 minutes, and Bridlington to Hull in 37 minutes. During World War 2, traffic to the East Coast resorts dropped significantly and it was decided to move the relatively new D49s to more useful duties. In November 1940, five D20s were moved to coastal sheds to replace them. Gateshead also received six D20s to help with heavy wartime main line trains. These engines were often used as pilots for D49s, Atlantics, Pacifics, and V2s. Withdrawals started during World War 2, with No. 1147 being withdrawn in January 1943. As might be expected of such a successful class, the first withdrawals were slow. 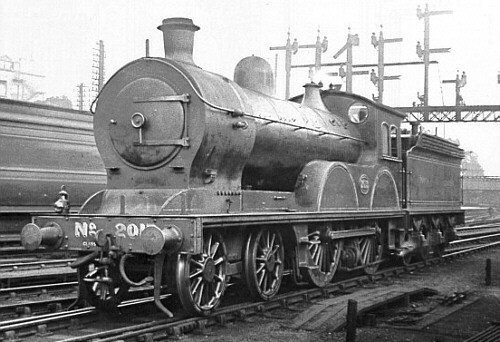 The LNER only withdrew ten D20s, leaving fifty to enter British Railway ownership (1948). These were allocated to Starbeck (10), Selby (9), Alnmouth (7), Botanic Gardens (5), Tweedmouth (3), Blaydon (3), Northallerton (3), West Hartlepool (3), Bridlington (3), Stockton (2), Duns (1), and York (1). Many of the last D20s were allocated to Selby. Their duties included helping with the growing post-War East Coast resort traffic, local workings in the Leeds/Harrogate/York/Hull area, and the Rowntree's worker trains to the the halt on the Foss Islands branch. The last D20 was withdrawn in November 1957. Heating Surface: Total: 1318.7 sq.ft. The last D20 was withdrawn in 1957, and none survived into preservation. Union Mills have produced a ready-to-run model of the D20 in the past. The scale was not correct, and Union Mills have ruled out the possibility of any future models made with the original tooling. However, they they have said that they might re-tool the D20 at a future date. DJH produce a whitemetal kit of the D20 for OO gauge (4mm scale). Thank you to the Mike Morant Collection for the photograph of D20 No. 62360. Thank you Malcolm Peirson for the photographs of Nos. 2027 and 2013.